Got extra summer squash? 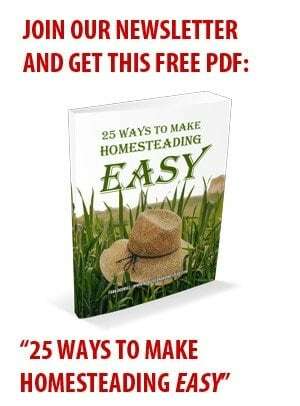 If you’re like most homesteaders, you probably do. These vegetables grow prolifically, and it’s not hard to find yourself inundated with more zucchini, butternut squash, summer squash, or winter squash than you know what to do with. While many people choose to dehydrate or freeze their squash, canning is a great way to save freezer and cupboard space. Canning is an easy way to produce a long-lasting supply of this delicious crop, as canned foods last over a year in most cases. Zucchini and other squashes must be canned using a pressure canner. Water bath canners only reach boiling point temperatures, while pressure canners heat contents to 240 degrees Fahrenheit. Any low-acid foods, like most vegetables, meats, and seafood, must be canned using a pressure canner to avoid the risk of contracting botulism or other foodborne illnesses. If you don’t own a pressure canner, don’t risk it—just go ahead and freeze your leftover squash. Keep in mind that if you are looking for crisp, crunchy squash, canning may not be your best option for all varieties. Freezing will work better, for example, for vegetables like summer squash. 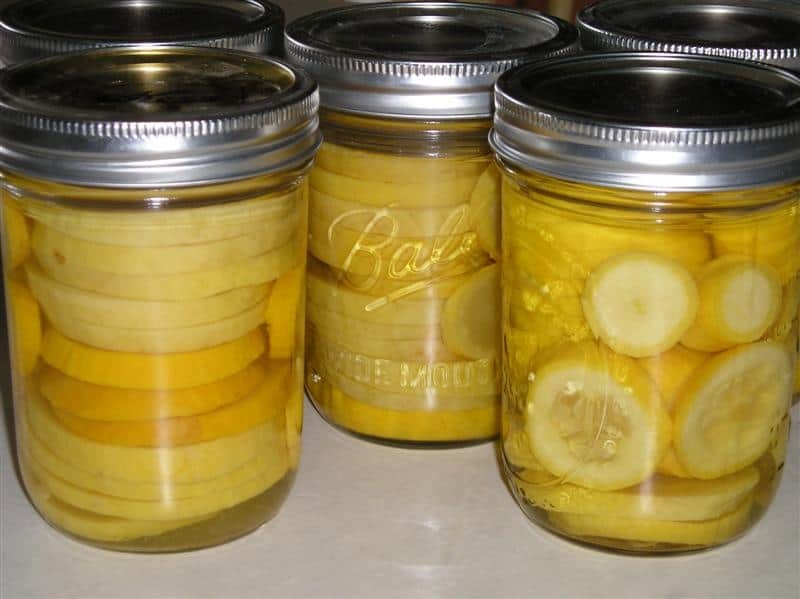 When you place sliced or cubed squash into a jar, it can become overly soggy and also affect the heating pattern in the jar. While spiralized zucchini, butternut squash, and winter squash all can quite nicely, it’s worth being willing to experiment with your canning recipes to obtain the proper ratios. Whatever doesn’t work well with canning can be frozen, pickled, or dehydrated. I either wash the jars in the dishwasher, or in hot, soapy water. Then, I place them in the oven and heat them at 250 degrees. I let them stay hot there while I prepare everything else. You will also want to sterilize your lids and bands, even if you’re using brand new bands (you should NEVER reuse lids, as the seal won’t be as effective). To do this, simply bring some hot water to a boil on the stovetop and drop in both the lids and bands. Then, bring the heat to a simmer. This will also help you keep them hot while you’re preparing the jars and ingredients. Bring a large pot of water to a boil. While it’s heating up, you can wash the squash, scrubbing it with a vegetable brush to get it extra clean. Cut the ends off and peel if you prefer it that way. You can then cut the squash into whatever shapes or sizes you need. The best options are as thick rounds about half an inch thick, or into cubes. You can also spiralize or shred your ingredients, depending on how you plan to use them later on. Whatever you do, don’t mash the ingredients before canning. Tests have proven that there are density issues with mashed squash that can prevent adequate heat distribution. You may choose to blanch the squash before canning as well. This will help preserve some of its freshness, but is not a required step. If you decide to do this, simply dip the squash for two minutes in boiling water. Pack the slices into hot jars, leaving about an inch of headspace. You can add salt if you prefer, but this is not required. Don’t add more than half of a teaspoon for pints or a teaspoon for quarts, as it will become overly salty over time. Pour boiling water over the squash, making sure to maintain that inch of headspace. To remove air bubbles, press with a wooden spoon or tap the jar gently on the counter. Then, wipe the rim of the jars with a clean, damp cloth, and place the lids and bands on the jars. You should process your squash at 10 lbs pressure weighted gauge, or 11 lbs for a dial gauge. If you are canning at a higher altitude, you will need to adjust accordingly. A full canner of pint jars will take around fifty-five minutes, while one of quarts will take about ninety minutes. Make sure your canner is maintaining adequate pressure during this time. Once the time has elapsed, wait for the canner to stabilize back to a neutral pressure before removing the lid. Trying to remove the jars before the pressure has equalized can be dangerous. You can always just let the cans cool in the canner along with the water. Place the jars on clean towels to cool and seal. Try to set them out away from a breeze, as this can cause the jars to crack. You may hear popping noises as the lids seal. Canned squash will store for several months on end. Signs of spoiled jars include mold or discoloration, although some white residue atop the jars is a normal byproduct of canning. You can simply wipe it away. Then sit back and admire your pretty little jars! The squash made really nice pureed baby food. I realized we don’t really eat squash much… at all. Since I don’t have a baby eating pureed foods anymore, I probably won’t can squash this year. We definitely prefer fresh squash and zucchini to canned. Recommendations for canning summer squashes, including zucchini, that appeared in former editions of So Easy to Preserve or USDA bulletins have been withdrawn due to uncertainty about the determination of processing times. Squashes are low-acid vegetables and require pressure canning for a known period of time that will destroy the bacteria that cause botulism. Documentation for the previous processing times cannot be found, and reports that are available do not support the old process. Slices or cubes of cooked summer squash will get quite soft and pack tightly into the jars. The amount of squash filled into a jar will affect the heating pattern in that jar. It is best to freeze summer squashes or pickle them for canning, but they may also be dried. I would think that chicken or vegetable broth would be a good liquid for the canning of squash. Add cut up peeled tomatoes and you got a real meal in a jar….with the broth, a really nice soup/stew. Think herbs too, like basil, oregano and thyme and the like. Don’t stop there, make vegetable stews and use your imagination. Fresh parsley or celery cut up in there too….go nuts. Just do it. I put stuff up all the time. And we have a garden. But don’t let not having a garden stop you. Go to the market in or outdoor and watch for produce sales at the end of the season and take advantage of it. I got lots of tips …..drop me a line at [email protected]. Definetly. Last year I mixed yellow squash with zucchini and Vidalia onions with garlic and rosemary and parsley. I also added one tablespoon of lemon juice to help with acidicity. I put them in canner my pint jars for 25 minutes and I tell u they came put awesome. I also experimented with fresh tomatoes peeled and cut in quarters and didn’t add them to mixture till the last minute. Few weeks later I opened a jar of squash and zucchini and it was amazing. The garlic the butter everything was so tasteful and it definetely wasn’t like baby food. Lol. I have quite a few yellow squash and zucchini. Could use some canning recipes and cooking recipes…best way to use them as pasta. Chop onion cook in skillet with butter until clear. Combine squash with slightly beaten eggs. Add cream of chicken soup and cornbread. Lightly grease pan and cook at 350 for 25 minutes or until golden brown. I’ve had better luck cubing squash instead of slicing it, then blanching and freezing. U don’t have to put in freezer. U can can them. Just scald them in hot boiling water for two minutes take out. Have ur garlic butter seasoning mixture ready. Make sure u have a tablespoon of lemon juice in jar before u stuff with squash. Pour mixture until u have half inch head space. Put ur sterilized jar tops on and boil in water for twenty five to thirty five minutes depending on ur boil level. Trust me. After a few weeks the flavor of ur seasoned mixture will infuse and all u got to do is open jar put in pan and warm and uve got a great side dish for any occasion. Delicious. Fresh. I don’t see where that amount of lemon juice used in low-acid foods would raise the acidity enough to safely can in a boiling water bath. Low-acid foods need to be pressure canned. Depending on geographic location your risk may be low to moderate, but it’s just a bad idea. I have been canning for 40 yrs peas,green beans,zucchini ,squash,tomatoes etc using the water bath method n still ALIVE. Never have we got sick from eating t garden foods. There wasn’t presser canners back in the day so why now. This year I actually fried some and put them on a cookie sheet in the freezer,when they were frozen I took them out and put them in freezer bags for storage. We like to heat them in our air fryer they are really good. I have canned squash for years and the only complaint has been that it gets too mushy. i came to this page to see if I could reduce the cooking time. Instead i read not to can it at all. I can it the same as other vegetables. 35 minutes for quarts at 15 psi. Try scalding it in boiled water for 2 minutes or less. And then stuff ur jars. Once u go to can jars make sure u got one inch head space and when the water is at a good boil try canning for only 25 minutes. I have never had a problem with my squash zucchini mix being mushy. When u open the jar and warm for a few minutes they still have a crunchy taste to them not to mention the seasonings u may choose to put in. I’ve learned the hard way. Trial by error and canning squash for me is easy peasy the best way to go just think in terms of mushy or crunchy? Ten minutes difference will not hurt bUT will make a definite difference in texture. I am not a fan of squishy squash too but I have found it to be so yummy in a squash casserole. Slice squash half in. thick, slice a med. onion, place onion and squash in a sauce pan with 3/4 cup water until just tender. Drain. Use a full sleeve of ritz crushed in a separate bowl, add one cup of shredded cheese (your flavor choice) to the ritz, mix it. Pour squash in pyrex casserole, mix in 3/4 of the ritz/cheese, add one egg, stir to mix thoroughly. Spread in the dish, sprinkle remaining ritz mixture over top as a crust. Bake in 350º oven for thirty min. or until top is golden brown. Way to easy. My sister tried this adding shrimp in the casserole and loves it even better. I used 3 pds of squash in this recipe. You will discover after making this at least twice that it is easy to adjust for one person or several. Over abundance of squash can be made into squash relish which is very good and can be eat with anything. My s and parents canned the same way. They didn’t have pressure canners back then. We have been eating canned tomatoes all our life and have never gotten ill.
Well tomatoes are high in acid so they’re more safe. Just a taste of botulism can wipe you out so I wouldn’t trust green beans or other low acid food. However when in doubt if there is botulinum toxin in your vegetables you can simply boil it for 10 minutes after taking it out of the jar and it will neutralize the botulinum toxins if present. Yes, needs to be pressure canned! There was no directions for zucchini in my book, so I used the green beans directions with my pressure canner. I pressure can everything I can, even higher acid fruits and tomatoes. I feel it is safer. Add lemon juice. I am eating on last years squash done with water bath. A bit soft but good. I can the way my great grandmother did and there were no pressure cookers then. And I’ve been canning this way for years and still alive. How exactly do you do this. I have no pressure canner. I love this argument. My grandmother never put us in seat belts and no one got killed in an accident! Guess I won’t tell my grandkids to wear a seatbelt either. Or that pesky sunscreen stuff. Come to think of it, there were no such things as car seats, either. Yup, if it was good enough for my grandmother and no one died…. You can’t see or smell if your food contains botuline toxin (cause botulism). But you can easily extinguish the toxine by cooking your food for 10 minutes before serving it. So if you use your canned squash to make soup or moussaka, there is no problem. More on botuline toxin: It is made by a bacteria (spore) that can only be killed by heating food for 15 minutes at 121°C that why one needs a pressure canner. You can also can regular canner, it will kill all other bacteria but not the one that produces botuline toxin. So when your jar is infected with this bacteria, it will produce the toxin (unless the jar contains an acidic mixture (pH lower than 4.8) or when the jar is stored in the fridge). By cooking the canned food for 10 minutes before eating, the poison breaks down. I want to make zucchini “apple pie” filling. The recipe calls for 2 cups of lemon juice and of course, other ingredients. It calls for 5# of pressure for 8 minutes. Is that a long enough time to be safe? I also saw another recipe for a hot water bath for 10 minutes. I don’t want to waste my time making this to have it spoil or be dangerous. Would appreciate you advice! Sorry I didn’t respond more quickly. Have you already tried canning this? I would be leery of pressure canning any vegetable for such a short amount of time. But it’s hard to say since lemon juice has been added for acidity. I just canned some of this today. I slice my zucchini in slices about 1/2″ thick. I put them in a pot with water just below covering them. I spice with cinnamon, allspice, nutmeg and mace (if you like it) and lemon juice. How much lemon juice depends on the size of your batch. I put 2 Tbls in a batch of 3 large zucchini. (Large in my case is a zucchini that is at least 12 – 14″ in length and filled out enough to make slices about the width of a large apple.) I cook them down until tender and liquid is thickened. You can add cornstarch to thicken to desired consistency. Once they are done, I ladle them into prepared jars. I put mine in 1/2 pt jars but we use them for fried pie filling, with bisquits ect. I put the lids on and place them in a water bath canner covered by at least 1″ of water. I boil them for 10 mins once the water in the canner is at a good roiling boil. Have done this for the last 5 years and we love them. Can’t tell it’s not made from apples. I was wondering if you could use the hot water canner to can zucchini as long as you add lemon juice. I have an over abundance of zucchini this year and I have run out of freezer space. Everything I read keeps saying pressure canner but I don’t have one of those. If the concern is because of botulism, wouldn’t putting in something acidic like lemon juice remove that concern. I’ve tried giving away zucchini and everyone must be overwhelmed like me and I hate to see it go to waste. When we had an over abundance of zucchini, I sold my excess to the local IGA. They gave me 89 cents a pound which was what they paid their distributor. Search your community for a local “farm share” . There is one in my community at a local church.They distribute your over abundance of food to lower income families. Do you have to cook them till tender first before putting into jar for hot water bath canning ? and for some reason it had a sour smell to it. I have been canning for years and this is one thing I did not have good luck with. any suggestions? It may be better for you to freeze your abundance instead. Does anybody know if you can can butternut squash? I’ve got TONS this year and would prefer to can it if possible. I prefer canning to freezing for the simple reason that should the electricity go out, all my hard work isn’t lost. Any help, QUICKLY, sure would be appreciated! I just found your post. Yes, butternut squash is can-able, follow directions for pumpkin butter. ONLY pressure can. In the USA butternut squash is known as a “winter” squash-which means it will last thru many months of winter. We usually (here in southeast) pick it when it is ripe. We then just store it in a cool dark place thru the winter,in a basket. Because butternut is a denser harder squash like a pumpkin it will spoil quicker if canned. Expect it to only stay canned about 4-5 months before it spoils. Many places say to not to can pumpkins due to being too dense to heat to required temp to kill bad bacteria. It HAS to be pressure cooker canned. It is just easier to keep the butternuts whole and just cut & cook as needed. i am new to this canning thing. my question is why did my canned squash turn cloudy? and why cant i just clean ( cleaning as it says to do) and put the squash in jars and seal with hot water in it and then let it call cool down before putting away? Not sure why exactly your canned squash turned cloudy. You must can it in a canner to heat it adequately. If you don’t put it in a canner and go through the process, you’re risking food poisoning. Good luck! It usually turns out cloudy if you use “table salt” instead of “canning salt” in the canning process. Make sure to use canning/pickling salt. Using table salt will turn it cloudy. Because you can’t clean off all the bacteria on and in the squash or even on the jars. Spore forming bacteria make spores that even boiling will not kill. Those bacteria can’t function in an acid medium which is why tomatoes and pickles can be canned with just a boiling water bath. But with non acid vegetables it takes the high temperatures you get with pressure canning to kill them. To get those high temps inside the jar you have to be sure fluid can move around inside the jar, which is why there is now a question about even pressure canning summer squash, since it squishes down to be very densely packed. Which I admit I have done in the past. I think you should buy a book or two on canning. My favorite is Putting Food By. So a pressure canner is the only only way to can zucchini? My grandmother and mother have canned zucchini made into pickles for 40+ years using a water bath canner. Never had a problem and none of us have ever got sick. Pickling them is one way to use up your excess zucchini. The reason why you had no problems was that you pickled them and that has the acid needed to keep the bacteria at bay. That’s not the case with canning the squash with just water and salt. Then you need to pressure can. So basically if I put vinegar in the water and salt mixture it is ok to can the squash.I was planning on making squash pickles. Came to this site and y’all have me seriously worried. *First time gardener and cannner here. I use my food processor to shred the zucchini and then i freeze it in small bowls. Once frozen, i pop it out like an ice cube and put in vacuum sealed bags. Use it all year in bread and sauces. Do you use a pressure canner when canning your squash without water? Can you shred zucchini and can it? And use it for Bread later on, without it turning into mush. I tried freezing and it just turn mostly water. I shred and freeze zucchini all the time for zucchini bread. It does get watery when you thaw it, but I just drain that off. You don’t want to drain off the liquid from the frozen zucchini, all the vitamins and goodness is in that water. I adjust the addtional liquid accordingly, to keep the batter a cake batter consistency. We love it fried with onions and salt and pepper. Yum! I find when using canned squash, if you drain it real good, have the oil real hot when you pour in the squash, then don’t stir or turn it for awhile, Then when you do turn it, use a spatula and carefully turn it, it won’t be so mushy. I can my squash without water. You will probably can squash again once you try it because it is good. The USDA cannot find an agreed upon time for pressure canning the summer squash. Having said that many canners(those with more experience than I) agree on about 40 min for qts. at about 10 lbs of pressure. As to the USDA comment about packing the jars. A good just barely ripe summer squash will hold it’s shape under canning. From what I’ve surmised packing the jar with the slices cut at a consistent size and NOT over packing solves the cook down problem. Using hot liquid will fill the jar and make sure the center of mass is started out hot. I am curious if using the pickle crisp would help with maintaining the firm texture most of us like. Maybe it’s time the USDA stopped running from the issue and did the studies to verify times/pressure etc so we all could enjoy canning this wonderful vege. After all if the electricity goes out your hard frozen work goes up in flames. Any thoughts? Canned squash may or may not be safe. I don’t know. But PICKLED squash/zucchini is safe and great on a tomato sandwich. There are plenty of recipes. I add salt, dill, onions and garlic to mine. It’s a great way to enjoy your produce later in the year. What was the texture like? I prefer fresh squash that I bake in the oven with onions, potatoes, carrots, zuccunni, olive oil and Italian Seasonings. Do these stay firm or turn into mush? They stayed firm enough to pick up in a whole piece, but they were very soft. this is my first time canning & i don’t want to fail. the question is , i have a pressure cooker not a pressure canner. what is the different? can i use pressure cooker instead of a canner. help i just don’t know. my other half keeps saying my parents always used the pressure cooker. HELP PLEASE I’m so confused. Debi from florida. Absolutely NOT.. you cannot use a pressure cooker to can. If you have an All American Pressure Cooker/Canner, that’s fine, but if it’s not a cooker/canner, you can not can in it. Many pressure cookers are made so they can double as canners. Additionally, you can use many other pressure cookers as canners PROVIDED YOU PAY ATTENTION TO DETAIL!!! First, you are going to need something to space the jars up from the bottom of the pressure cooker. If your cooker came with one of these, it is intended to double as a canner. Once you have cleared that obstacle, you need to know how much pressure is generated before the cooker vents. If it has a gauge, this is another sign that you cooker is a cooker/canner. The amount of pressure is a function of the weight that sits on the vent. The pressure may be indicated on the weight. Check with the manufacturer to see if other pressure weights are available for your unit. Finally, you need to know how much pressure is needed for canning at your altitude. Too much pressure is not a problem, because it will result in greater heat – too little pressure won’t kill the microbes you need to kill to safely can low acid foods. Pressure canners are available for less than $100.00. My 23 quart canner will do 16 pint jars (with room left over for 8 more 1/2 pints) – or 7 quart jars and 8 pints. It has a gauge and generates up to 17 psi. That’s enough to safely can low acid foods even in Denver! It cost me $90.00. My point is simple: Canning equipment can be had for not a lot of coin. Unless you really know what you are doing, you are better off buying a dedicated canner. Once you know what you are doing you can always take another look at grandma’s pressure cooker. I have used overgrow zuccini. making sure seeds are not woody, cut in about 1 inch round slices, dredged in egg wash, Italian bread crumbs and fried till light golden brown on both sides in olive oil. Drain and cool on paper towels and freeze in single layers in freezer bags. Reheat in oven and serve with a sprinkling if your favorite grated cheese. You can serve them over spahgetti or rice with roasted onions, garlic, olive oil and more cheese. That sounds really good, Annie. Thanks! I have done this with Squash and green beans for years also my grandma and great grandma never hurt us either! I currently have some in a hot water bath… I half the zucchini & roast it in the oven. Scrape out the fleshy part of the zucchini & blend it in the blender. Pour into jars & cold pack for 3 hrs. I make alot of zucchini pies in the summer. One taste like sugar cream pie . The other like pumpkin pie. I cook the zucchini first to make the pies so canning the squash would be perfect. I also make baked zucchini long slices like eggplant parmesean with left over spagetti sauce and meatballs and italian sausage. Hey everyone! If you haven’t done it, you need to do it! Pickeled zuchinni is the bomb! Kosher Dill as well as Bread and Butter is unbelievably good as well as a great way to put all that over sized squash to great use. In fact, I let mine get BIG, lay quart jar along side BIG zuc, cut to fit, then make spears, stuff back into the jar and pour your pickeling liquid right over them and process in water bath! Doesn’t get any better than this! I like to saute’ summer squash with minced garlic, chopped onion and diced tomatoes with olive oil, season with salt and pepper and Italian seasoning. You can serve it chunky like that or simmer for a bit. It makes a delicious meatless sauce over pasta with fresh grated parmesan cheese! Thank Kendra for all the great information on canning, drying and freezing. I’m starting to get a bumper of squash so I am gearing up for the season. I see a lot of folks dehydrate it…then what do you do with it and how do you store it? and in freezing- do you slice it or shred it? thanks!! I store my dehydrated squash in covered mason jars, and toss them into soups and stews as needed 🙂 I slice mine to freeze. Hope that helps! I did try frying squash I had canned by your instructions and they turned out great. Thanks very much. Wonderful, Carol!! I’m wishing I’d had more to put up… mine’s all gone!! I have just been reading this about the Zucks. And I’m going to give it a try. Mine are going nuts here in Washington state. Last year I froze mine and didn’t like the way they tasted later. I normally only make stewed zucchini or zucchini bread. I am wondering if anyone has tried to can stewed zucchini yet. I am sure they are being very cautious, as they should be. I take it that they are concerned about round slices packing too tightly. I wonder what would happen if they were quartered and processed longer (i.e. the standard 1.25 hours for pints, 1.5 hours for quarts)? I feel confident that this method would be safe, but what would be left? Mush? How do we can or perserve our spaghetti squash for the winter being that this weather here in the midwest so dry and hot with no rain for so long. Our spaghetti squash has gone nuts and a couple of them are almost as big as small pumpkins but we have tried something different this year I went to raised beds and newspaper straw and grass clippings and a little peatmoss. I would like know if I could because we don’t want our hard work to go to waste. I want to thankyou for your time and if you could give us a short E-Mail back we would appreciate vary much as we are retired now and home all the time. best wish from house to yours. I have a bumper crop of both zucchini and yellows going and the growing season is just getting started. Bring water to boil and cook squash for 3 minutes before jarring. Pressure cook for 40 minutes at 10 pounds. Boiling water kills most bacteria, so this is why they did it in days gone by. Also, if you like to can your own tomato and spaghetti sauces, just temporarily freeze some of the squash until you’re making your sauces and marinaras. They add great flavor and texture. leaving apt now to go to “farm”, nephew’s house, to pick and can green beans. we are bucket rich in zucchini this year. been baking gluetin free zucchini bread and muffins. will try canning. love onions, garlic, squash in spaghetti sauce over GF spaghetti. Can u just boil on top of store ( the jars ) after u get zucc put in them…instead of using a pressure cooker..
Christie- if you want to can them, you’ll need a pressure canner. The Amish have been canning squashs for years and I am sure our great grandparents and further back were also canning it. Why all of a sudden is it not safe? Anyway according to an Amish cookbook I have the time they say for pressure canning the squash is 90 minutes. Oh wow. Thanks Tresia. I wonder why there is such a discrepancy in time among recipes? Freezing is probably the way to play it safe, if long term storage isn’t the goal. Thanks for the heads up! HOW DO YOU COOK THE SQUASH AFTER IT IS CANNED. I’VE NVER LIKED COOKING SQUASH AFTER IT IS FROZEN, IT TEARS ALL TO PIECES. SO HOW DO YOU COOK THEM? Why is canning summer squash or zucchini not recommended? Also putting glass jars in a dry hot oven could cause them to shatter and is not recommended by any reputable guides as a safe way to heat and sterilize your jars. OMG!!!! I have been looking for hours! This is so easy. Thanks for posting it!! i just read it is not safe to can summer squashes, but my husband’s favorite is tomatoes, green pepper, onion and squash. I can for 90 minutes and make sure i re-heat it thoroughly. Grrr, I see it now! Lol…lonnnnng day! I may just be really tired and not with it tonight but you didn’t mention canning salt? This isn’t exactly on topic, but–when I cook corn on the cob if I have extra ears leftover, I cut the kernels off the ears and freeze them in pint sized bags. This gives me frozen corn for winter without having a marathon freezing session. I usually don’t cool the ears by putting them in ice water, but it can easily be done. Also some pressure cookers (not canners) will process pints if you have only a small amount of whatever available. This, too, is not as disruptive as a major canning session. When using the pressure cooker I cut a piece of coth to fit the bottom of the cooker to protect the cans since the rack, if there is one, might make the cans too tall to get the lid on. Pressure cooker instruction books used to explain this. Wanting to make sure readers understand that the squash must be “Pressure Canned” If not your lids may look sealed but they are not! You could poison yourself and your family by serving Squash that has been canned using a waterbath method. They are probably sealed. That’s not the issue… low acidic foods must reach a temp of 240°F to kill off botulism spores. Only pressure canning can reach this temperature. I’ve found my canned summer squash is too mushy unless I use the older squash. The nice young squash I now eat fresh, freeze or dehydrate. I only can the squash that *gets away from me*…big old zukes or crooks. Thanks, I only ever grew up eating it fried. Since being on my own I have used it in stir fries, fresh on Kabobs and grilled. Just what I needed my eight ball squashes are starting to bear in this HOT weather. Thanks, this is just in time, I got two free bags of zuchinni this morning! How do you use it once it’s canned?? We like to eat squash and onions fried in olive oil until tender and just browning, then sprinkled with lots of salt and pepper. I’m hoping these canned squash will do well with that, though this is my first time canning squash so I haven’t tried it out yet. If it’s good, I think next time I’ll can squash and onions together, if that’s okay to do. You could also add it to soups, stews, and spaghetti sauce 🙂 I’d imagine casseroles would work too.